Coinman is one of life's victims, the receiver of subtle bullying in an office environment and thinly disguised control in his own home, but remains true to his desire to be polite and accepting of how he is treated by everyone. Then, an incident at work changes all that. Huffington Post: One of the best literary fiction books of 2016 (Independently Published). 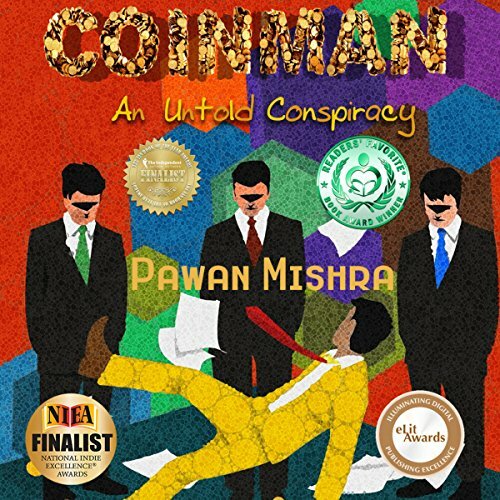 Coinman: An Untold Conspiracy is beautifully written and the story is nothing like what I've encountered before. The story revolves around a man with OCD who likes to jingle coins in his pocket, so his coworkers nickname him Coinman. The group of people he works with constantly gossip about him, spread rumors, mock him and pull pranks on him... basically bullying him. Coinman doesn't have the easiest life at home either, with a wife obsessed with her own well-being, and a mother obsessed with making her son's marriage successful, the man can't catch a break. I was really close to giving it more stars but something kept haunting me: this book is marketed as humor. And while it is filled with humorous elements, I was too frustrated by the behavior of all the co-workers to really focus on the satire. But I still recommend it. It's an amazing read.